We came across a story published by DailyMail about a mother having suffered from a severe skin condition. 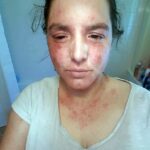 Mr.s Halliburton began suffering from eczema flare-ups on her face and neck every few days after falling pregnant with her daughter four years ago. The skin condition left her with red, sore skin, that cracked open to cause weeping wounds. After getting no successful treatment from doctors, she took matters into her own hands and began consuming cannabis oil (CBD) which is legal (and widely available) in the UK. I would feel like I wanted to rip my skin off. 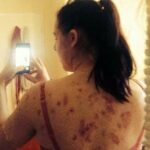 It started on my back and cleared up after a course of steroids but straight away it flared up on my face and neck and has been constant ever since. It would flare up every couple of days depending on what I was eating and it would be an uncontrollable itch and no cream I put on it would soothe it. In fact, it would often make it worse. I would feel like I wanted to rip my skin off. I felt like I couldn’t go on anymore as I was just not getting any answers from the doctors. On bad days I wasn’t even able to take my daughter to nursery or would be unable to work or leave the house and a combination of antihistamine and painkillers would make me drowsy. Mrs. Halliburton had eczema as a child but quickly grew out of it and believed the hormone imbalance in her body during her pregnancy was responsible for the sore and itchy skin condition. 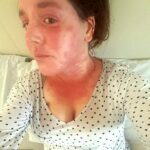 Struggling to find the ongoing cause of her eczema, she attended numerous GP appointments where she was given courses of steroids, light treatment, and blood tests. It wasn’t until August 2 this year that Mrs. Halliburton’s flare-ups got out of control and she was rushed to Dr. Gray’s Hospital in Elgin by her concerned husband. I couldn’t move my face and neck and there were open wounds on my chest that were weeping. I was cold and shaky and felt very sick. In the hospital I was placed on a drip overnight to treat the infection that had gotten into my skin. All my tests came back normal and doctors wanted to discharge me so I could be treated at home but I broke down in front of a nurse as I felt like I couldn’t go on. It seemed there was never going to be an answer. Only until her father suggested trying CBD oil. She came across a shop that offered the oil in a vape form. In just two weeks, her skin began to clear, and she had not suffered any flare-ups. She had even managed to get away with eating foods which would previously have caused skin reactions. At first, I tried the liquid form but found I hated the taste, but I discovered the vape shop was selling it when I walked past one day and I’ve not looked back since. I hope it continues to work so I can lead a normal life. I’ve been able to go shopping with my little girl, even go back to work. Alexis has noticed the difference as she always had to stay in the house with me. I have been able to eat bread and other things I haven’t eat in a long time without flare-ups and even had a glass of wine. It’s always great to see how cannabis can drastically improve the lives of so many people all over the world. If you want to share your story with us, feel free to send us an email or add a comment below.